SCVHistory.com LW3318 | Film-Arts | Cliffie Stone Record Label: Newhall Records, 1966-67. Cliffie Stone had his own music publishing company in the 1960s — Central Songs, at 1804 N. Ivar Avenue in North Hollywood. One of its labels was Newhall Records, used at least in 1966 and 1967. Another label was Granite Records. In addition to these and Capitol, RCA and Warner Bros., Cliffie was affiliated with the following labels: Beltone Records, Lariat Records, ARA Records and Showdown Records. Country-Western recording artist, producer, talent scout and promoter Cliffie Stone lived in the Sand Canyon area of Canyon Country (Rolling Stone Ranch, 27731 Sand Canyon Road) and was inducted in 1990 into the downtown Newhall Walk of Western Stars, which he helped organize. He died Jan. 17, 1998, at home. Clifford Gilpin Snyder (Gilpen? ), born in Stockton, Calif., on March 1, 1917, and raised in Burbank, was for many years almost a one-man country music industry on the West Coast. Son of the banjo player and comedian known as Herman The Hermit, Stone began his career in the late 1930s as bass player for big bands such as Anson Weeks and Freddie Slack, before playing bass for Stuart Hamblen. By the early 1940s he was bandleader and featured comedian on "The Hollywood Barn Dance" on the CBS radio network. In 1946 Stone joined Capitol Records as an A&R man, but also did at least four major daily radio shows ("Dinner Bell Round Up," "Rhythm Ranch," "Cliffie Stone's Western Party" and "Western Stars") on local stations as a disc jockey or performer. His "Hometown Jamboree," originally a radio show, became a pioneering TV show in Los Angeles and was nationally syndicated. Stone guided the career of Tennessee Ernie Ford, and wrote or co-wrote many hit songs, including "Anticipation Blues," "Smokey Mountain Boogie" and "The Shot Gun Boogie" for Ford, and "Divorce Me C.O.D.," "No Vacancy" and "So Round, So Firm, So Fully Packed" for Merle Travis. As an artist, Stone had several chart hits, including two Top-5 hits in the late 1940s: "Silver Stars, Purple Sage, Eyes Of Blue" and "Peepin' Thru The Keyhole (Watching Jole Blon)" on Capitol and later started his own Granite label. Stone received the Academy Of Country Music's Pioneer Award in early 1973. In 1989 Stone received a star on the Hollywood Walk of Fame and was elected to the Country Music Hall of Fame. LW3318: 9600 dpi jpeg from original 45 rpm record jacket purchased 2018 by Leon Worden. 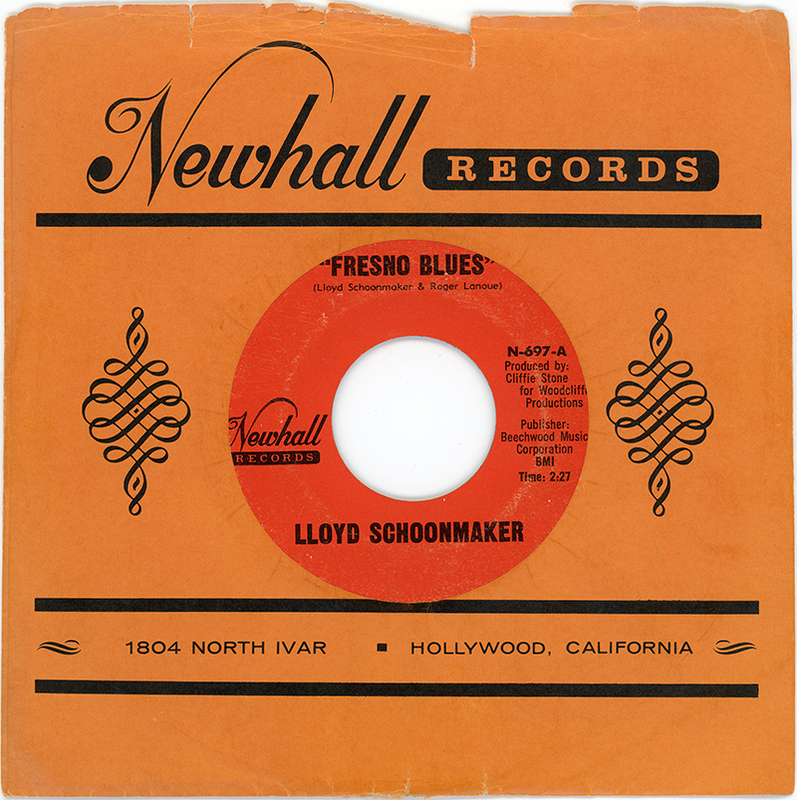 The record, "Fresno Blues" featuring Lloyd Schoonmaker, was purchased separately.